Continuing with our attempts to fix Traffic Violations, we took videos of Traffic Violators in the months of July to September and sent the complaint to Additional Commissioner of Police, Kilpauk. After 5 months of fruitless attempts at capturing videos of Traffic violators and sent 4 complaints to Mr. Karuna Sagar, Additional Commissioner of Police (Traffic), Kilpauk, we were totally frustrated at complete NIL response from Mr. Karuna Sagar. Not knowing what to do, but with a very strong intent to do something, we started disturbing Traffic Constables at signals and started speaking to them. Few Constables shown interest in our intentions and directed us to meet Guindy RI Mr. Selvam. Then one day, we met Mr. Selvam and shared with him about our idea of video capturing of violators, analyzing the videos to find the Registration numbers and Vehicle Types of violators and reporting to him. We expected him to take our complaints accompanied with clear video proofs and send summons to the home of violators asking them to pay the fine. But Mr. Selvam told that it beyond the power to do the same and I should speak to Additional Commissioner of Police, Karuna Sagar about this. And If he gets order from him, then he told that he will take it up forward. 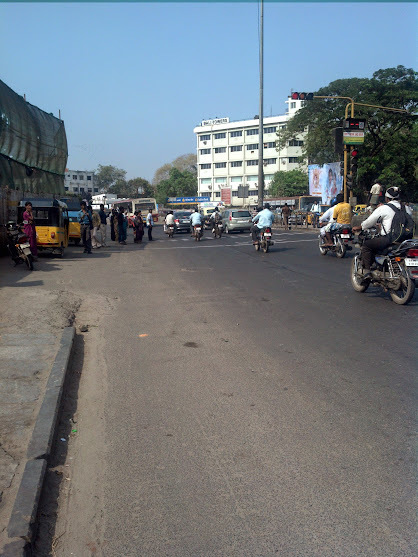 Then the other day we went to ACP (Traffic) Office, Kilpauk. But sadly we went on Sunday and most officers were in leave. Videos to be recorded, 3 different times of a day and for 5 days. The video should be for 1 hour. Videos to be taken for 5 days, thus 3 x 5 = 15 videos. Analyse the videos thoroughly and note down all violators, in the format: violation type, vehicle type, vehicle registration number, time of violation, etc. Document the whole as a project and submit it to Additional Commissioner of Police (Traffic). Create a web portal for public to upload videos of Traffic Violations. Publicize it and attract more social activists in getting videos of Violations. When around 1000s of videos are gathered, contact ACP office again. Then they will take it up forward. But both these efforts would require enormous time effort to accomplish and so put on hold for the time being. A point to understand the work load, to analyse and find all traffic violations in a video, it would take me 15 minutes. Thanks to Christian Mathew Philip for he published an article about our activities, which gave us contact of a bunch of individuals with similar thoughts. Hope we could take it forward, with the support from those people. I read your efforts on traffic awareness and your efforts are appreciated however if you really want to get work done I suggest you meet with Mr. Karuna Sagar in person you see many times officials at that level aren’t able to go through all the complaints as understandably they are busy with traffic management and other pressing issues. I know Mr Sagar personally and can guarantee if you went to him with a complaint he would take immediate action, as commissioner trichy he gave his personal mobile number to the public and urge them to call and report any issues they had. I also was informed that he now holds additional charge as Addl. COP North L&O so he must have his plate full. Anyway I wish you luck in your endeavour! thanks for the tip Viren. We visited Addl Commissioner office, Kilpauk where Mr. Karuna Sagar works. But we went on Sunday and he is not available. We spoke with other officials and we were told he wont be meeting public even If we come on weekdays.. !! That can’t be right, he has always welcomed the public and their suggestions when it comes to policing perhaps it’s the juniors who think he won’t why don’t you give me a number where I can call you and let’s see if we can’t sort this out! Cheers! Also he no longer sits in the kilpauk office but is located in the chennai police headquarters in vepery.